Of course, there are plenty of reasons to send what would be counted as obsolete systems on Earth into space. Mitigating risk is a big part of the job of space exploration, and with the price for failure so high, only proven technologies are generally sent upstairs. That has been true for pretty much the entire history of space exploration and doubly so for manned missions; the Apollo Guidance Computers of the late 1960s were built around resistor-transistor logic (RTL) chips for this reason, even after transistor-transistor (TTL) logic chips had been available for most of the decade. By the time the Voyager mission’s Grand Tour of the Solar System was being planned in the 1970s, NASA had a fair bit of experience building space probes. The Pioneer missions were the basis for much of what NASA learned, culminating with Pioneer 10 and Pioneer 11 probes being sent to explore beyond the asteroid belt for the first time. Those probes were extremely stripped down, at least as interplanetary spacecraft go, with no onboard data storage to speak of. Commands from the ground and data back down had to be sent in real time. That would never cut it for Voyager, a much more extensive mission with a huge suite of scientific payloads, each of which generated far more data than could be instantaneously streamed. Voyager needed to save data and send it slowly back to earth. A NASA backgrounder on the Voyager missions shows that a data storage was specified that could buffer about 536 Mb, or the equivalent of 100 full-resolution photographs from the spacecraft’s camera. 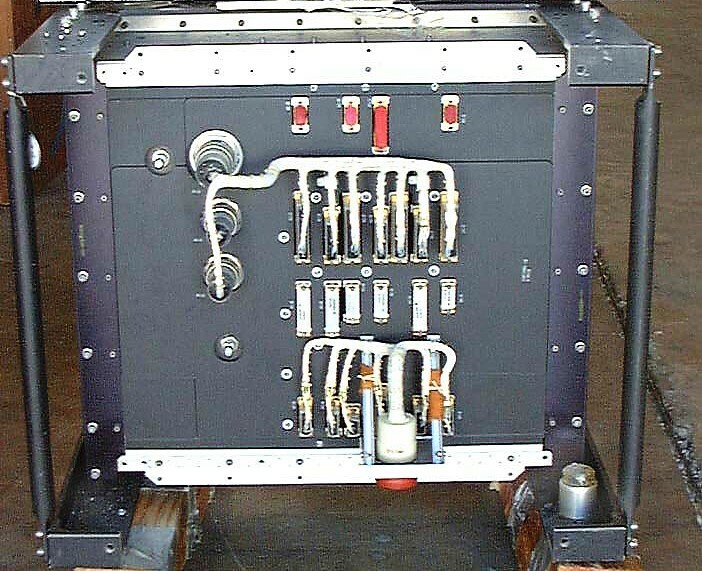 The data tape recorder (DTR) system was subcontracted to Lockheed and manufactured by Odetics Corp. 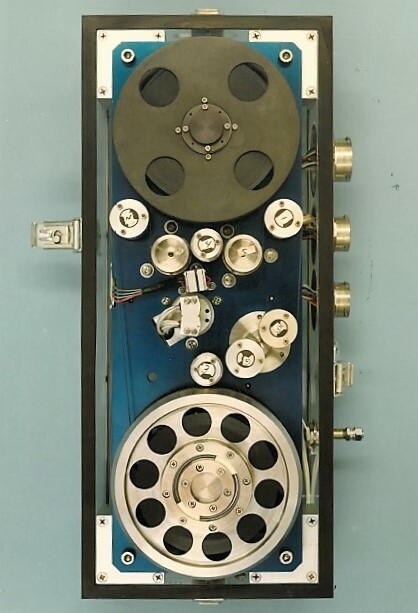 The specs show that the machine was a belt driven recorder that used a 1,076′ (328 m) long reel of 1/2″ (12.5 mm) wide magnetic tape which recorded data on eight separate tracks. The DTR could record at two different speeds – 115.2 kbps and 7.2 kbps. Playback topped out at a much slower 57.6 kbps, with 33.6, 21.6, and 7.2 kbps being options as well. It appears that none of the non-flown DTRs exist in any museum collections anymore, and all we have is one picture of the mechanism. It’s clearly much more sophisticated than the standard 8-track cartridge transport for consumer use at the time. This isn’t your grandfather’s 8-track. First, the tape does not appear to be in a continuous loop as it would in an 8-track cartridge. It appears to come off the lower reel and loop around several idlers and pinch rollers before passing through the read-write heads in the center of the unit. It then routes around several more idlers, two of which appear to be mounted on a rotating platform, before heading to the upper reel. It’s hard to get an idea of the size of the DTR from this photograph, but another artifact exists that gives us some clues. The DTR was installed in a rack in the spacecraft that mounted inside one of the ten equipment bays located in a ring under the high-gain dish antenna. The Smithsonian has a DTR bay assembly in its collection, and lists the size as 24″ high x 19″ wide x 14″ deep (56 cm x 48 cm x 36 cm). Given the arrangement of the connectors on the backplane, the DTR is probably about 24″ tall and about 10″ wide. Exactly what the composition of the magnetic tape was, and what secrets were used to prevent it from degrading in the harsh environment of space, are unclear. Odetics, the manufacturer, claimed that the tape would travel through the mechanism a distance of 2,700 mi (4,400 km) before discernible wear. It seems to have worked. The DTRs in both spacecraft performed flawlessly from their launch in 1977 and through the entire Grand Tour mission, as well as the extended mission that set both vehicles on a course out of the solar system. In 2007, the DTR in Voyager 1 was shut down for good, not due to any issues with the unit, but because of the dwindling supply of power coming from the craft’s radioisotope thermal generators. As of this writing, the DTR in Voyager 2 is still working, but is likely to be shut down as the power wanes in that vehicle. Soon we’ll lose contact with both of these platforms for good, and they’ll pass silently into the interstellar void. And if anyone does find them someday and learn how to power them back up, maybe those primitive tape recorders will spin back up one last time. Maybe we did send our best stuff out there after all. Our mainframe, back in the early 70’s, used 10.5 inch NAB spools containing 3600 feet of 1/2 inch tape as primary backing store (the exchangable disc packs had a massive 60 megs, so there was a lot of tape!). We also used smaller tapes known colloquially as halves and minis; the spool in this unit is around the length of a mini and it even has 8 tracks, so it is definitely tried and tested technology. The tape used was particularly thick and tough (if you sliced it down and put it in a 1/4 inch tape recorder the coercivity of the tape would mean it failed to record audio particularly well and it would wear the record head out in no time) so I suspect it could easliy survive many years of use provided it had a sealed inert gas environment, rather like the early winchester disk packs. You assume that all aliens are ahead of us in technology. Given the size of the universe that is very improbable. For this story to be relevant they at least need to have a space presence. Otherwise it’s just another piece of space junk. Yeah, but the aliens with Victorian or earlier tech aren’t going to find Voyager, are they? It’s not gonna encounter a planet on its own, and on the infinitesimal chance that it did it would unceremoniously burn up like any other small meteor. We couldn’t find a Voyager if we didn’t already know where one was, There could be a billion alien Voyagers in our own Oort cloud and we’d be none the wiser. So yeah–they’d be quite a bit more advanced than we. We’ll (hopefully) more advanced in 10,000 years but Voyager won’t, maybe the first alien probe we find will be equipped with mechanical television and magnetic core memory. There’s been life on this rock for ~4 billion years. Most of that time was unicellular or bacterial. There were a few hundred million years worth of dinosaurs. Another few hundred million years worth of mammals as well, so far. People come in at like 250 thousand years. 0.007% of the time of life on earth. How old is the telescope? So when the bacteria on whatever planet get squashed by the 8-track tape machine, I don’t think we’ll be have to be apologizing for our low tech. Assumptions all the way, from starting with unicellular, to duration of said events. In other words just because it happened that way here doesn’t mean it’ll have the same everywhere. None of that is assumption — it’s all in the fossil record — except for the joke at the end about the machine landing on an inhabited (by anything) planet. It’s so much more likely to get pulled into a sun or hit a random rock. Finding technology produced by aliens at our own level or even less advanced still might advance our own technology significantly. If they developed their technology along a different path than us, even their primitive solutions to problems might be something unique that we haven’t seen before. It might not replace our current technology but it might prove to be a better solution in specific situations. When mixed with our current tech it might inspire us to see things differently and explore some different paths we had not considered. We might modernize their old tech to produce something new that we wouldn’t have thought of otherwise. Well it was assembled on Earth so there’s a nice oxide layer on everything. But that would probably wear through eventually. The “idlers on the rotating platform” referenced in the tape-path discussion is probably a spring-loaded tension mechanism to keep the tape taut over the heads. I think it’ll take the alien equivalent of a ham radio operator to decode the Golden Record. In about 50 more years, they’ll be the only ones on Earth able to play it back and properly decode it. i doubt that very much. What would we do if we found something that is alien to us? We would study it in every way that we can. Surely somebody would think to look at that strangely textured surface with a microscope. Then it wouldn’t take a genius to guess that those squiggly grooves might be encoding some sort of information. Unless they are in some sort of cosmic “garbage patch” with alien probes “washing up” every day the disc will probably be too priceless to take a needle to but I’m sure they will figure out quickly enough how to turn a high resolution image from a microscope into their equivalent of wav data. Also.. I am pretty sure that I remember reading that either the record itself or something else attached to the spacecraft included instructions for playing the record in the form of a pictograph. It’s kind of like the Ikea instruction manual of homebrew record players. I don’t understand why you keep trying to force comparisons between this data recorder and an 8-track audiotape. Hmm. Both use half-inch tape and record eight tracks. So? Lots of data recorders used half-inch tape and recorded multiple (sometimes 8, sometimes more, sometimes less) tracks. The article keeps pushing the notion that the Voyager data recorder somehow sprung from the consumer music format. An article describing the Voyager hardware without this sketchy equivalency would have been fine. Give it UP! Puzzled me as well, mostly because of all possible formats consumer 8-track is the least similar. The title contains a typo ;-) Shouldn’t it be “The Not-So-Low-Tech Data Recorders bon voyage(r)” ? And here comes a growing light source image and then……..kerchunk………we miss it. I always hated the breaks on those 8 track tapes when concept albums were rearranged and edited. I remember reading that the voyager image capture software was completely re-written between the Jupiter and Saturn encounters. One of the things they had to include was firing the thrusters to keep the camera aimed correctly during long exposures [because of the speed the probes were moving], but they also had to modulate the thrusters to take into account the torque of the data recorder starting and stopping. Uploading that firmware and waiting for the first new image must have been a bit of the knee-trembler. Thank you for this article. The fast that a tape recorder could function perfectly for so long has always been a mystery to me, and I have had no luck (before this) finding any meaningful information. Thank you Hackaday! Dan notes that it doesn’t loop like an 8-track cassette. Is this for conservation of momentum? How much does the probe wobble during a fast-forward-then-rewind cycle? Probably for conservation of the tape isn’t it? Pulling the tape from the middle always seemed like a high friction option. Is anything of that tape really going to still exist by the time the probe reaches another star system? Sure, lasting from the 70s until now IS impressive but surviving the interstellar journey is an entirely different thing! Really looking forward to watching this episode of Techmoan. 7 Track and 9 track magtapes were standard storage up through the 1980s. I’ve got two bins full of Scotch BlackWatch tapes. Then there were the 1″ DecTape and LinkTape formats. This was standard computer technology for the 60’s and 70’s.